Minister of Public Utilities Robert Le Hunte. Government remains committed to increasing the use of renewable energy in TT. 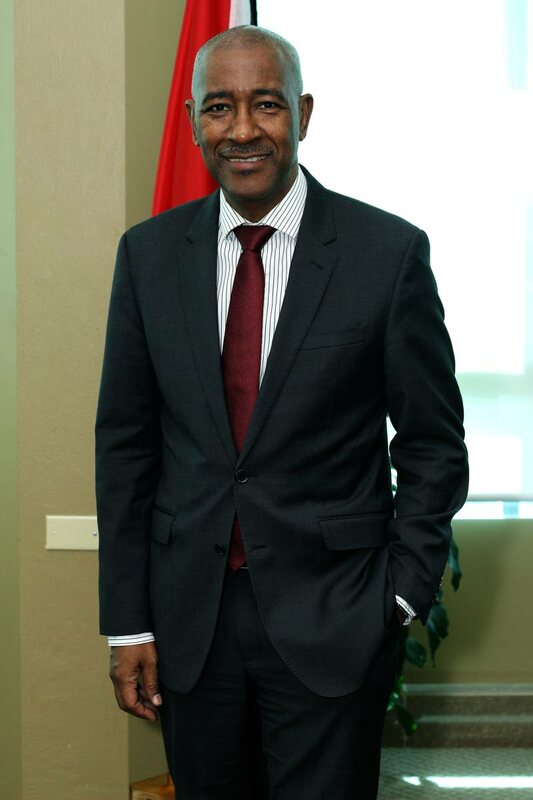 Public Utilities Minister Robert Le Hunte gave this assurance as he pointed to the 2018/2019 budget presentation in the House of Representatives last October, when Finance Minister Colm Imbert had said TT planned to increase energy supply by using renewables up to ten per cent by 2021, in accordance with the Paris Agreement on climate change. Imbert had said one project geared towards this goal was the allowance of small producers of renewable energy to feed electricity into the national grid. He explained this involved amendments to the TTEC Act and the Regulated Industries Commission for utility scale renewable energy development and waste to energy development. In the former, Imbert said expressions of interest (EOIs) were received from three independent power producers (IPPs) for the development of utility scale renewable energy power generation. Energy Minister Franklin Khan has since advertised EOIs for utility scale renewable energy projects with a minimum generating capacity of three megawatts. On the waste to energy initiative, Imbert said EOIs were received from developers for the establishment of a waste to energy plant at the Beetham landfill. On Monday, Le Hunte said these plans remained on track and explained that proposals have since been received and were being evaluated. In terms of reducing the country’s carbon footprint, Le Hunte said this fell within the Planning Ministry’s remit. While TT remained committed to meeting the requirements of the Paris Agreement, Le Hunte said the country finds itself in the unique position of having an excess capacity of energy. He attributed this in part to the allowance that had been made for an aluminium smelter under the Patrick Manning administration. Le Hunte added that the smelter never materialised as the People’s Partnership government scrapped the Alutrint project. He said TT must find a balance between meeting its power needs and environmental conservation. In an address to the 2018 TT Energy Conference last January, Le Hunte said there can be no doubt that renewable sources of energy are the way forward for TT, the region and the world. He said given the challenging times facing TT’s economy, the country did not have the financial ability to undertake “capital-intensive projects of a national scope,” which means renewable energy sources will be part of the energy mix in these kinds of infrastructural projects. The minister said TTEC has made inroads in the field of renewable energy, among them the completion of a pilot solar project and a small-scale wind resource survey in Tobago; development of a manual titled Wiring for Renewables in anticipation of implementation at the domestic level; collaboration with the TT Bureau of Standards and the Electrical Inspectorate to establish standards for certifying equipment and building wiring; the provision of assistance to the Energy Ministry in the development of a national renewable energy policy and the feed-in tariff policy. The feed-in tariff policy will facilitate access to the national grid for renewable energy projects. “In so doing, (the policy) will encourage interested parties to develop these projects,” he said. 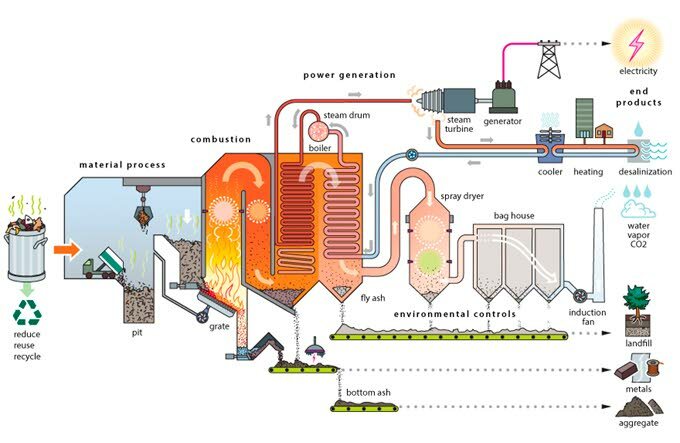 There are different types of waste-to-energy systems or technologies. The most common type used in the United States is the mass-burn system, where unprocessed MSW is burned in a large incinerator with a boiler and a generator for producing electricity (see illustration). Another less common type of system processes MSW into fuel pellets that can be used in smaller power plants. Reply to "On the road to renewable energy"